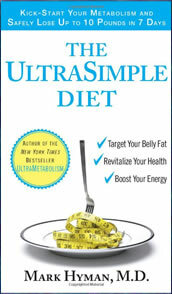 The UltraSimple Diet: Kick-Start Your Metabolism and Safely Lose Up to 10 Pounds in 7 Days is a new book by Dr. Mark Hyman. He is also the author of Ultrametabolism: The Simple Plan for Automatic Weight Loss, the bestselling book (reviewed here). The UltraSimple Diet is a 7 day health program (rather than a diet), targeting what the author sees as the major factors in the obesity problem – toxicity and inflammation. In his new book he gives readers a plan to detoxify the body and reduce inflammation. Dr. Hyman classifies certain foods as “bad” food and other foods as “good” foods. UltraBroth is a vegetable broth, whose recipe is included. Dr. hyman recommends one should drink 3–4 cups of UltraBroth per day, as part of a meal or as a snack. UltraShake also has a recipe provided, and is designed to sustain you, even out your blood sugar, and help control your appetite throughout the day. UltraShake contains essential protein for detoxification, omega-3 fatty acids from flax oil, fiber for healthy digestion, increased elimination from flaxseeds, and anti-oxidants and phytonutrients from berries and fruit. Variations are suggested to maintain interest. UltraBath is a 20 minute bath before bed each night, in a hot bath containing Epsom salts, baking soda and lavender oil to the recipe given. UltraBath promotes relaxation, enhances detoxification, and improves sleep. If no bowel movement by 10 a.m., take herbal laxative (2–3 capsules). Lunch 2 cups or more of steamed or lightly sautéed veggies (enough to feel gently satisfied). Dinner 4–6 ounces of fish or chicken breasts cooked with olive oil and lemon juice OR 4 to 6 ounces of tofu or legumes. (spice up meals with rosemary, cilantro, ginger, garlic, turmeric, or curry, and sea salt). 2 cups or more of steamed or lightly sautéed veggies (eat enough to feel gently satisfied). ½ cup cooked brown rice 1 cup. ½ cup fruit or berries for dessert (either here or at dinner). As recommended in the book, you may end the program after 7 days, or keep on it until your ideal weight or desired health benefits are achieved. Maintaining the program for an additional three weeks is ideal, but you may continue the program for a full 3 months if you choose. After 3 months you may be able to tolerate foods you are sensitive to as long as you only eat them occasionally. After completing the diet, does the weight stay off or is this more of just a detox where the weight comes back right after you’ve stopped following the menu plan? How hard, and how yucky are the food tha t you have to eat? does it take a lot of preparation for the food? i’m currently on mayo clinic diet and i want to start this in two weeks. this does indeed work, I did it for a week and lost 6 pounds, it’s usually very difficult for me to lose any weight since i never really have much to lose. i did take the olive oil and lemon juice in the morning, i mixed it in a shot glass and just drink it all at once, it’s actually not that bad, just tastes like salad dressing. i bought the ingredients for the shake; but mostly i just used the flaxseeds, chocolate rice protein and banana, i didn’t put a lot of things into it and it tasted good. this is a very good and healthful detox. do any of you drink the olive oil/lemon juice when you get up? Sounds pretty tough to take. bought the book today. I’m going to try the pre-diet week starting tomorrow. I hope this works because all the fruits, veggies, and health food store additives are going to be pricey. Well, I am over 45 as well as my husband and we both had potbellies, we did this diet and he lost 10 lbs I lost 8 the first week and went down 4 more lbs weeks later. we were bad eaters and didn’t follow it to the letter (no excercise) but we still lost easy for those who find it hard to eat right. we fell off the wagon but we are getting back on this one. less than a year later i still only gained 5lbs of the actual 11. Everyone asked how did you lose the weight it stayed off for almost 9 months without the diet. Going back on tomorrow. I had a hard time stomaching the UltraShake at first as well. I tasted really chalky and gritty. Although, I stuck with it and now I love them. The only fruit I use is organic blueberries and strawberries (frozen-cheaper). I have yet to take the full plunge into the diet, but instead I am taking it slow. I want to develop lifestyle habits not just go through the motions for a week. My main goal is to modify the diet for my 1 year old who has moderate eczema. I am hoping to find out what allergens can be triggering her reactions. Anyone else have any experience in this area? Checked the book out of the library. I think I need to do this. Allergies, food sensitivity and chemical sensitivity are ruining my life. I need to detox. I just started this diet today and had my first ultra shake and it was awful. I’m not picky when it comes to this kind of stuff, but my shake was just so bad I could barely drink it. Does anyone have an alternate recipe for this that has the same benefits? I’ve been doing this detox a few times a year since 2008 and I love it!! I lose about 7 – 10 pounds in a week. It’s a great way to kick-start a diet or lose those few extra pounds for a special event. I modified the diet a little bit however because I didn’t have ultra shake or ultra broth. For breakfast I have a glass of freshly squeezed juice (carrots, apple, organge, beet, celery juiced in a juicer), a glass of hot water with lemon and a cup of green tea. This will make you go to the bathroom right away! For lunch I had brown rice with steamed un-salted veggies and for dinner I had the same thing except added tofu. I had my berries for 2 nights and an occasional cup of organic vegetable broth. The first couple of days are the hardest as you will experience headaches and fatigue because the shock your body goes through. But I promise it gets better. You’ll be amazed at how much flavour veggies have without adding extra salt, fattening dressings etc. By the end of the week I felt energetic, rejuvenated and skinny! I’m not going to lie–it’s very tough and by the end of the week you’ll want to throw your plate at the wall because you’ll get so sick of eating the same thing. But it is worth it. After the detox, continue eating healthy and you’ll keep off the weight you lost. It can be more than just a quick fix! Fantastic! This should be the way you eat period. This is great. I think I’ve finally found my diet. It should be called a diet but a way of life. fruits, veggies, fish and lean meats. simple..the diet is only 7 days. Even though the supplements is what costs the most. Get your f’s and v’s from the farmer’s market and just do it. stop complaining the way you look, if you’re not going to do anything about it. This diet is extremely complicated. If your a beginner to dieting like me its hard keeping up. Especially if you are working crazy hours and dont have time to go get all these weird things. What the Hell is borage oil???? Define simple, this sounds more complicated than my chemistry class. So, has anyone had any success on this diet? Hey ,has anyone tried this diet and does it work or what kind of results did you get? There are few of you that need to detox your attitudes! Be nice! green tea has caffiene so does black and white, black tea is like old tea leaves possibly fermented? and contains the most caffiene and i personally don’t like it, green is fresh tea with mild taste and only a small amount of caffiene per serving, and like someone else said the benefits far outweigh the little bit a caff. white tea is the freshest(youngest) tea that still has the ‘fuzz’ on it and has more antioxidants and the least amount of caffiene. how do i know this? i don’t know, thanx to whoever posted the recipes and how much the book costs! the only reason u need an herbal lax is cuz its horrible to not poop while cleansing, u need to get the toxins out so they dont get re-absorbed. doesn’t anyone else think this is kind of messed up? You idiot. green tea does have caffiene. Black teas have more caffiene, then white, then green. know your facts. LB, you can purchase either caffeinated or decaffeinated green tea. Either one is allowed since the benefits of green tea outweigh any caffeine. Danielle, the plan is actually not complicated. I did it for a month and after suffering for 25 years with severe allergies and taking Zyrtec daily, my allergies are now gone. Simply because I discovered what foods I am allergic to (mainly gluten) and removed them from my diet. I also learned a lot from doing the program about my body and food in general. Increased awareness is a very powerful thing. Best of luck to everyone! You CAN do it! you idiot!! green tea does not have caffine! Optional: add 1 tbsp. of nut butter (almond, macadamia, pecan) or 1/4 cup of nuts soaked overnight such as almonds, walnuts, pecans, or any combination of these. Same as Version 1 but replace rice protein powder with 1/4 cup silken drained tofu, 1/2 cup plain, unsweetened,gluten-free soy milk such as Silk and reduce the added water to 2-4 ounces. Same as Version 1 but replace the rice protein powder with 1/2 cup plain, unsweetened, gluter-free almond or hazelnut milk and 1-2 tbsp. of nut butter (from above version) and reduce added water to 2-4 ounces. Heat and drink 3-4 cups daily. UltraSimple my a$$! This is one of the most complicated diet plans I’ve read about on this site. Plus you have to buy the book to get the ‘ultra’ recipes, you nimrods! Many green teas are caffeine free! Does anyone know the recipes for the ultrashake and ultrabroth? Where can I get the recipe for the ultashake? Green tea is supposedly an appetite surpressor. You have to buy the book, I think that’s the point. Doesn’t green tea contain caffeine?! I Need the recipe for the Ultrashake and the Ultrabroth. this diet does not show the recipe for the ultra shake or ultra broth. Cannot do it without it.